Have you ever found yourself inside of a doctors' waiting room? Waiting, waiting, and more waiting. And then just when you think your turn has finally arrived, you're actually just moved into a smaller waiting room. Regardless of what people think, doctors cannot do it all. Doctors are often talented and brilliant, but that doesn't mean they have enough eyes, hands, and time to take on all of the facets of patient care at once. There are a host of different tasks necessary inside of any professional medical center; and there are a host of tasks when serving patients themselves that are best handled by someone other than the doctor. Medical assistants help serve as an extension of doctors themselves. And depending on the specific field of medicine, they could have several of any number of medical responsibilities they aid doctors and patients with. If you're interested in the medical field and want to pursue a career there, then earning your Associate's Degree in medical assisting will show you how exactly you can begin serving others. The tasks of a medical assistant are general broken down into two main categories. 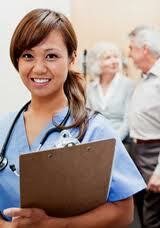 First, a medical assistant might be responsible for administrative work within medical settings. Doctors need plenty of help making sure that everything within the office regarding their supplies, responsibilities, and patients, is organized and running smoothly. Secondly, a medical assistant will also be responsible for providing clinical assistance, working directly with patients' basic needs in the office. Because the medical responsibilities are often complex and diverse, the medical assistant provides that first hands-on line of patient care, helping simplify the entire patient experience. Along these two lines of duties, medical assistants are needed in a wide variety of settings. Nearly all types of doctors require assistants in their offices. Pediatricians, general practitioners, chiropractors, therapists, podiatrists, and so on all need individuals who can meet with patients and attend to their general needs. Hospitals, also, are in large need of medical assistants who can perform a variety of medical tasks. Whether caring directly for patients, collecting information, serving in a particular department, or supervising a particular area, medical assistants are largely required to perform the essential day to day functions that keep a facility organized and operational. The common responsibilities of a medical assistant wherever they work include a mix between the administrative and clinical tasks. The medical assistant often collects information from patients about their medical history, current condition, insurance, and other essential information. They also will take vital signs including pulse, blood pressure, and urine samples, and record all of this information. They might prepare blood tests for laboratories, give shots, and perform any other medical tasks as directed by the physician. Administratively, they make sure that information provided by patients and doctors is carefully recorded and filed so that it can be easily found when needed later. They schedule patient appointments, answer questions, respond to phone calls, and perform those basic functions that are required to keep an office going. And, at the end of the day, they might even give kids a little lollipop and a smile. So many people are easily frustrated at doctors' offices because of the waiting and waiting they do. Then again, it's called a Waiting Room, so is there any chance of not waiting? Regardless, it is the medical assistants many of us have to thank for fulfilling their responsibilities admirably and keeping the work in their office or hospital moving. Patients often only see doctors for a few moments, and it's those medical assistants who really are the ones serving patients from beginning to end. With your Associate's Degree in medical assisting, you will be one of those friendly and welcomed faces that will earn the gratitude from doctors and patients alike. So stop the waiting, and earn pursue your degree to become a medical assistant today. Join the American association of medical assistants. You’ll get updated on federal and state laws. Get your CMA certification status verified by employers once a member. Stay updated with industry news including how to update your CEU’s as well as receive exam discounts. Receive job leads as a member and the ability to connect with others in the industry. Because you have plenty of options when it comes to enrolling in a medical assisting program be sure to find one you feel comfortable with as well as one that is affordable. Credit Transfer – Do you already have an certificate program and need to transfer your credits into an Associate’s degree? Be sure to let your admissions counselor know of any previously taken courses so you can get credit for earned courses. Job Leads – One of the strengths of a school is if they have the ability to offer job leads to their graduates. No school can promise you a job but they do have resources which will provide job assistance. It is advised that you research the schools placement rate which will give you a good idea of how well they place their graduates. You can also get professional resume help as well as help with interview questions. Externships – During your last few months of your education it is common that you take an externship. This externship will not only give you great clinical experience but a way to be evaluated for possible employment. Assist Patients – Assist physical exams, weighing and measuring patients as well as reviewing medical history for allegories or previous medication complications. Prepping Patient – As a medical assistant you’ll give assistance to doctors, follow medical protocol as well as collect data on the patient including vitals. Prepare Rooms – Part of your responsibility will be to prep the room for new arrivals making sure the doctors and nurses have everything they need. Front Office – Some of your duties would include scheduling appointments, perhaps assisting with admissions and even medical billing duties. Fluids – Drawing blood will be one of the primary roles will be to prep and eventually draw blood. Also collecting and preparing lab specimens and getting them ready for the lab.